Howard Gladstone is a singer-songwriter and co-founder of Torus Power. His latest album Hourglass is being released in the USA and worldwide on June 15, 2018. Recorded in high-resolution audio, Hourglass is available to our mailing list subscribers through a special discount offer from HDTracks, the world’s leading on-line HD retailer. Your discount code is HDSonicPeach20. Click the link below to order. Continue reading to learn more about Hourglass. Howard Gladstone’s Hourglass available on HDTracks . Order now, special discount expires July 31, 2018. Gladstone has written songs that give a message of hope, perseverance and optimism. Three years after spinal surgery Howard Gladstone has returned to music with a higher level of commitment and inspiration, and deeper understanding of its healing power. Gladstone has written songs that give a message of hope, perseverance and optimism. 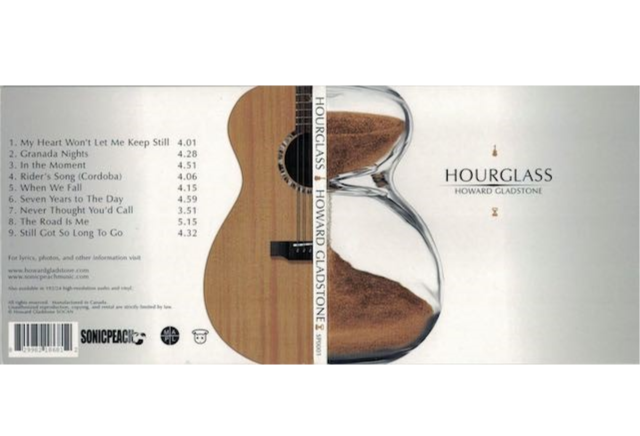 The songs on Hourglass have resonated well with early reviewers and audiences and are starting to receive international radio airplay. The album sparkles with an occasional Latin accent from accomplished vocalist, pianist, songwriter Laura Fernandez and guitar licks from the virtuoso fret-burning jazz guitarist Tony Quarrington. Acoustic bass master George Koller shines throughout. Gladstone in partnership with Laura Fernandez founded Sonic Peach Music, an independent record label specializing in HD recording. Hourglass was recorded at 192kHz/24bit resolution by Peter J. Moore, Grammy-winning recording and mastering engineer. All future releases on Sonic Peach Music will be offered in HD as well as SD resolution.